Wintrust Arena: half empty or half full? Among the numerous story lines surrounding DePaul’s debut season at Wintrust Arena, the most critical — and perhaps the most concerning — is attendance. Twenty-loss season after 20-loss season did its part to bleed enthusiasm out of the program, but a home court stationed up to 90 minutes from Lincoln Park via CTA made attending home games more of a hassle than a pleasure. DePaul’s Athletic Department says Wintrust Arena was built with students in mind, hoping improved proximity to the Lincoln Park campus would bring more students to the games and make Blue Demon basketball more accessible for local basketball fans. 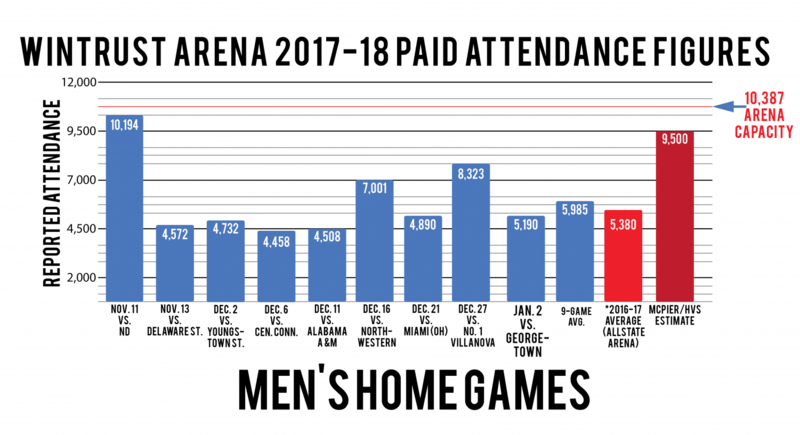 Last season, DePaul’s paid attendance — which includes tickets given away for free by the school and those who buy tickets and stay home ­— averaged around 5,380. According to calculations from HVS, a New York based colsulting firm hired by McPier, DePaul will need to average 9,500 in 16 men’s basketball games this year in order to break even on operating costs. Through nine home games at Wintrust, the Blue Demon’s are averaging 5,985, according to attendance reported in final box score.